Family: Malvaceae (Hibis-cus: ancient Greek and Latin name, syri-acus: Syrian) This beauty was discovered in Korea. 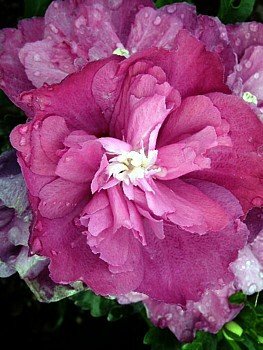 A standout plant with rich, deep, pink flowers reminiscent of an exotic Japanese Peony with its abundance of petioloide stamen. Superb. The plant you will get is growing in a 2 1/4 inch pot.